Deadpool: Bad Blood Review – AiPT! As of late, it appears that Wade Wilson is getting more attention than even some of the most prominent superheroes/villains, and whether or not you consider yourself a Deadpool fan, it’s difficult to not appreciate what he’s done on the big screen as what he means to comic books. But, this article isn’t an ode to Deadpool, it’s a review of Deadpool: Bad Blood, and that’s what you came here to read, right? Deadpool—more popular than ever before—in his first Original Graphic Novel! Deadpool’s been shooting, stabbing and otherwise annoying people for a long time now. He’s made a lot of enemies. One he can’t quite place is the brutal Thumper, who keeps showing up out of the blue to pound him into jelly. What is Deadpool’s past connection to this beefy face-masher? And what’s up with Cable, Domino, and the others on the cover? Are they going to show up in the book? (Hint: They are!) Deadpool co-creator Rob Liefeld on pencils and inks teams with writers Chris Sims and Chad Bower (X-MEN ’92) to tell the tale of his greatest creation (just roll with me here) getting his heinie handed to him! Check it out—before Deadpool checks YOU out! 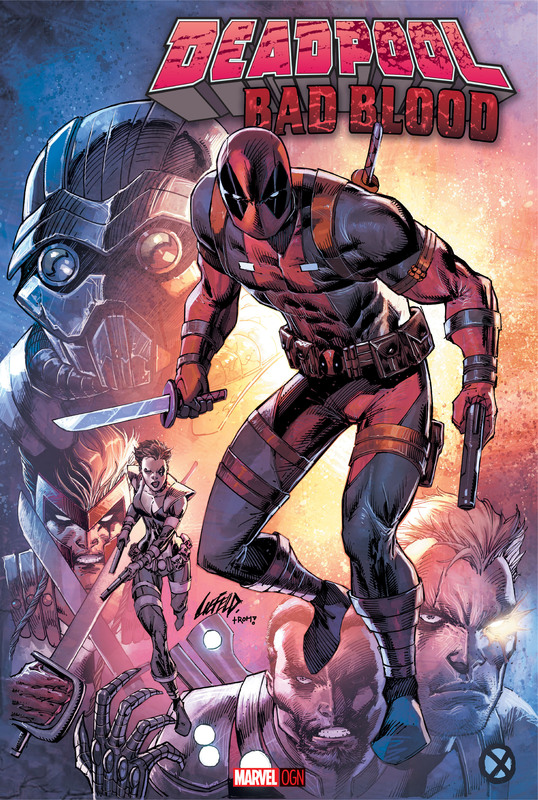 Deadpool: Bad Blood is the Merc with a Mouth’s first original graphic novel, and as the description from the publisher promises, Deadpool really does get the snot kicked out of him in this graphic novel, and it’s fantastic. No one in the Marvel Universe takes a beating the same way that Deadpool does; fans and newcomers alike can appreciate the humor that Deadpool brings to being beaten to death–literally, Deadpool makes being beaten to death funny. Nuts, right? This original graphic novel works very well because of the talent that was involved in its making. Being a 90’s kid myself, artist Rob Liefeld was one of the main figures who defined for me what comic books look like. And while there are two types of comic books fans—those who like/appreciate his style and those who mock him for covering his over-muscled, disproportioned characters with unnecessary pouches—his work on Deadpool: Bad Blood is stellar. Every panel was brimming with energy and excitement, and for those of you that aren’t on team Liefeld, his designs were modest, and his anatomy work wasn’t nearly as expressive/overexaggerated as was typical for him in the past. Writers Chris Sims and Chad Bower do an amazing job piecing together a one-shot story that’s not only entertaining but feels complete as well. I found myself laughing several times throughout my reading, and even now, as I write this review, recalling some of the funnier scenes have me smirking. If you’re looking for depth, look elsewhere. If you’re looking for a brutally good time, call Deadpool: Bad Blood. If you’re looking for a brutally good time, call Deadpool: Bad Blood. This, Deadpool's first original graphic novel, is one hell of an entertaining read that fans will love.